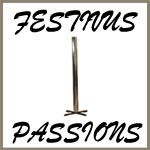 Lets Celebrate my favorite part of Festivus is the feats of strength. oak274274 is not a member of Festivus Passions. I do not really have a favorite. I am not a fan of this. I prefer the true meaning.